The Tour del Sol is held on the beautiful roads of Southern Utah. Photo by Todd Ellis. 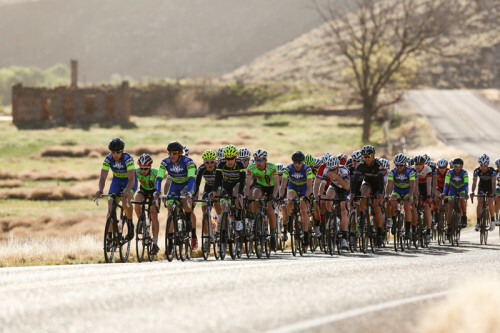 Racing along the Tour del Sol Time Trial course is like riding through an alien landscape. Distant rose cliffs paint the gaps between dusty hills. Mountains rise like jagged teeth behind them. Sage, grass, and cactus speckle the foreground with dots of green. Wisps of sand trail lazily, like spectral fingers into the sky, as bursts of wind stroke the hilltops. One-by-one, cyclists attack St. George’s Southern Parkway in the TT. Like birds of prey they fly over the tarmac, soaring, climbing, diving, digging into the corners and spitting out speed. Desert rats and Lizards scurry from sun to shadow, trembling, seeking refuge as these exotic creatures fly past. TT riders start in a staggered formation. Every 30 seconds the next rider is launched. Some riders like to explode from the start. Some like to pace themselves at the beginning and ignite during the final stretch. I believe the Tour del Sol TT favors the latter. Straight out of the gate there’s a steep .5 mile climb followed by an easier 2 mile grade. The upside is it’s a 2.5 mile downhill sprint to the finish! Some of the riders could use drag-chutes after crossing the line. In the Men’s Pro 1,2,3 TT: James Peterman (Sonic Boom Racing) flash-burned the course in .23'21″000! (Faster even than last year’s winning TT time of 23’51”000 ). Sonic Boom Racing Teammate, Fred Shattell (Sonic Boom Racing | Lucky Pie) was hot on his heels with a time of .23'42” but still .21 off the mark. Rounding out the top three in the TT was Matthew Deangelis (Primal Wear | Audi Denver) with a good showing of .24'24”. The Women’s Pro 1,2,3 was restructured this year—due to few signups in that category. So the Pro Women were bundled into the Women’s Masters 35+ in all events. Here, we report on the highly competitive women’s 3-4 field. In the Women’s 3-4 TT: Rachel Holzer (Mad Dog Racing | Microseal/GQ6) showed us what champions are truly made of, with an impressive time of .27'59”. Alison Knutson (Harristone | Sun Valley Mortgage) flew into second with a time of .29'00” & Darcie Murphy (No Team Listed) climbed her way to third with .29'20”. 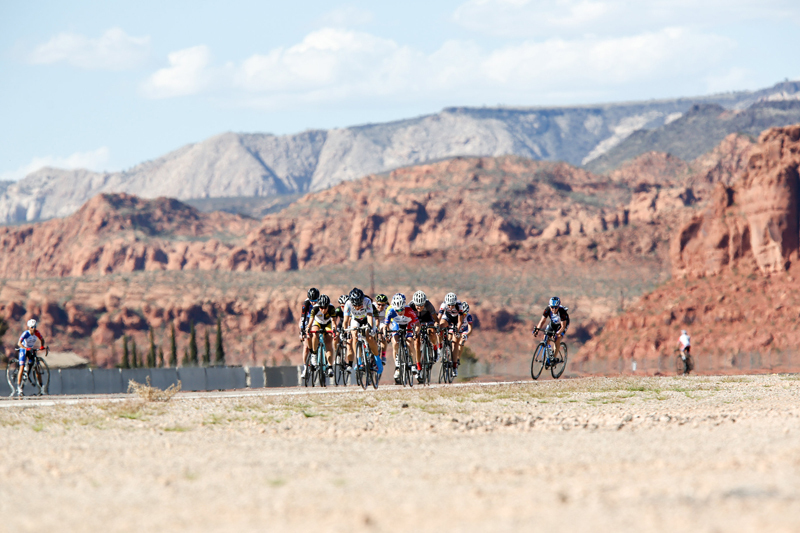 Held at St. George’s old airport runway, the Criterium’s views of the valley fill you with wonder. Like NASCAR for cyclists, Crit riders enjoy a flat oval track, scream through left-hand turns, and fight for position in straightaways. In a photo finish, the Men’s pro Crit 1,2,3 saw Joe Waters (Canyon Bicycles | Shimano) lead the pack across the finish with .59'54”. with Bryce Olsen (LiVe Well p/b Bountiful Bicycle) fractionally behind him .59'54”. Richard Knutson (Cicada Racing Inc. p/b Mark Miller Subaru) brought in third with 1.00'00”. Joan Meiners (Utah State University) led the Women’s 3-4 Crit across the finish with a time of .35'47”. Rachel Holzer (Mad Dog Racing p/b Microseal/GQ6) pulled across a second behind her with .35'48”. And barely nudged Jillian Gardner (Canyon Bicycles) .35'48” into third. (front, center) from Las Vegas. Photo by Todd Ellis. Sunday morning welcomed riders with rays of golden sunshine, topaz skies, and mild temperatures for the Road Race. 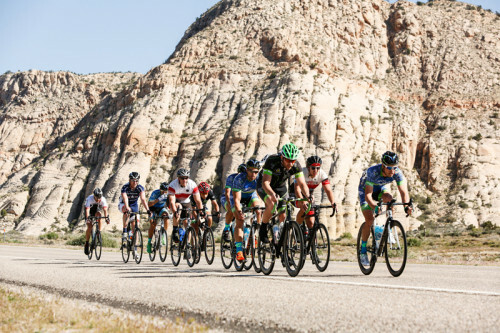 With a route that sports one of the toughest climbs around at its mid-point, the Men’s pro 1,2,3 RR thought it would squash the spirit of the riders as they clawed their way up the hill. But with a shot of sunshine and a nice tailwind to fuel them, the pro men’s 1,2,3 riders made Heartbreak Hill look like a kiddy ride this year. Gilbert Ducournau took the win in the road race over Las Vegas rider Matthew Shackley. However, Shackley claimed the overall title. In the Women’s 3-4, Joan Meiners of Utah State University won the sprint over Rachel Holzer, who took home the overall win. Alison Knutson was second overall and Darcie Murphy rounded out the podium. 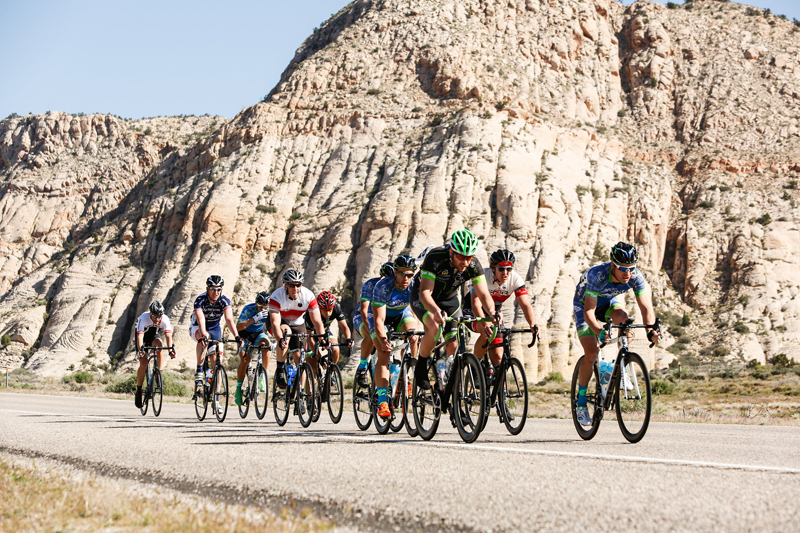 Thanks to Mother Nature’s cooperation, race officials and organizers efforts, and enthusiastic cyclists, the Tour del Sol 2015 was a hit!